Get a little extra lift! 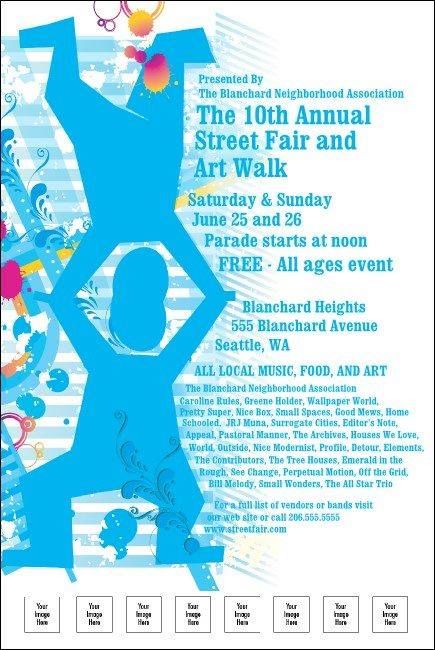 Elevate your local exposure with this Street Fair Poster in blue, white, and orange. With an image of two acrobats achieving great heights, and space on the template for you to add six images of artists, bands, sponsors, or anything else you're moved to advertise, it's an easy way to rise above the crowd. Show them what you're made of with image uploads from TicketPrinting.com.